Do some sightseeing around Dubrovnik on one of top guided tours and you'll never view Dubrovnik in the same way again! The Sponza Palace is one of the most beautiful palaces in the city. 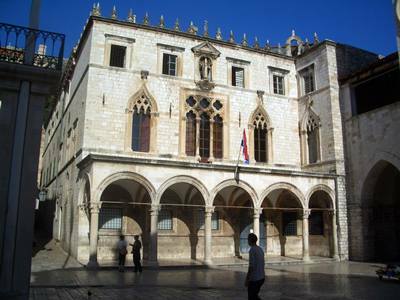 During the era of the Republic of Dubrovnik it housed the Customs Office, the State Mint, the Bank, the State Treasury and the Armoury. The structure is rectangular in shape and encloses a yard. The building blends Gothic and Renaissance styles. Nowadays, the Sponza houses the Dubrovnik Archive, which boasts one of the richest archive collections in the world, the oldest document preserved in this archive dating from the year 1022. Today, it is also home to a memorial dedicated to the Croatian War of Independence The exhibit includes portraits of more than 300 defenders and civilians who lost their lives during the siege. Be sure to see if there are any special events taking place in the palace courtyard. With its excellent acoustics and elegant architecture, this area frequently hosts concerts, theatrical performances and art exhibitions.